For this tutorial, we assume that you successfully worked through the Tutorial: Install Known, you now have Known running on an Amazon Web Services EC2 virtual server, with your chosen hostname set up to point to your server, and you are logged into your site. Now we will configure Known, and related services. 1. Go to the site configuration page by selecting "Site Configuration" from the drop-down menu in the top-right corner. 2. 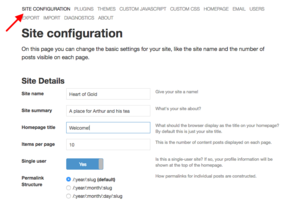 Configure the site as you like. Note that there are many tabs on the top of the site, all of which contain configuration settings. We will only discuss those that are important for Indie Websites. This page was last edited on 30 December 2017, at 16:40.